The airfoil propellers for the Boone Aeration & Environmental Tubeaxial Fans are designed and engineered for absolute maximum air delivery. They are cast of heavy duty, shatter resistant aluminum alloy. Each propeller is statically and dynamically balanced and secure to the motor shaft with a unique self-locking feature…all models, 18 inches or larger, are fastened to the motor shaft with Taper Lock bushings. 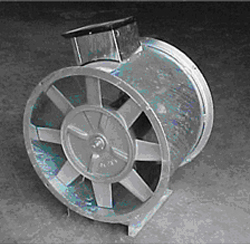 The fan housings are fabricated to rigid tolerances for precision interchangeability of parts. They are constructed of heavy gauge galvanized steel…arc welded. A heavy gauge wire safety guard is furnished as standard equipment. Every fan is fully tested before shipment to assure perfect performance, and … all fans are warranted for one year. Boone Aeration & Environmental created these fans especially for aerating up to 80 feet of corn or beans or 60 feet of wheat or milo. The horizontal vanes smooth and direct air from the propeller to reduce turbulence and increase efficiency. This feature produces maximum air flow with minimal power consumption and makes the Boone Aeration & Environmental Vaneaxial out perform conventional fans of comparable horsepower. Slightly curved at the intake end, the vanes assure the greatest air capacity being drawn into the fans for maximum air delivery on both single and two stage models. In addition, every Boone Aeration & Environmental Vaneaxial Fan has the same important design and fabrication features of the Tubeaxial.